Good Stuff NW: Tickle Bee Time! Dave saw him first. Our neighbor, Mace, was on his knees in the school field across the street. No, he hadn't lost a contact lens or dropped his keys. You see, Mace is a bee guy, and he was giddy over the Andrena sitiliae that had just made their annual appearance in the field. 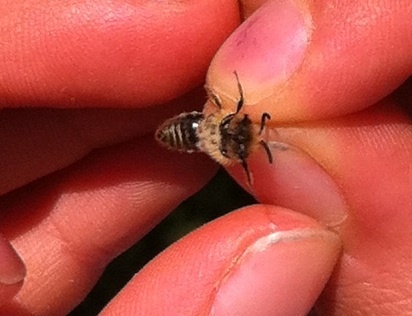 The school kids call them "tickle bees" for the way they feel when they crawl on your skin without biting or stinging. Mace's assistant, a budding entomologist. 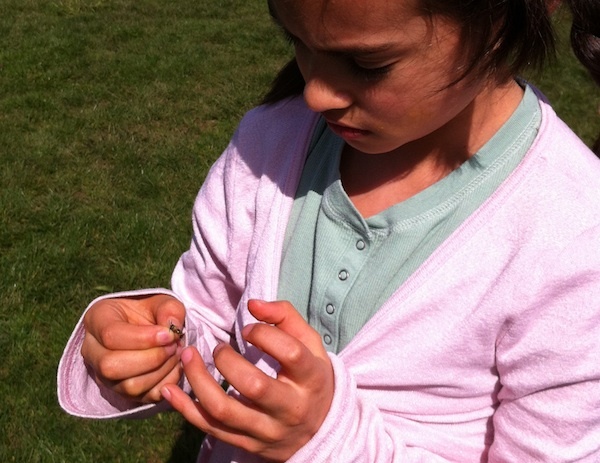 Mace, the pollinator program director (like I said, "bee guy") for the Xerces Society, has been helping to educate the kids about these little bees and their importance in the local ecosystem. He's working on a video about the bees to use at the school and to help illustrate the importance of pollinators on his nationwide lecture, so I'll post that when it's available. Until then, enjoy these little guys for what they signify. As Mace said, "It's a sure sign that spring is officially here." I'm so glad you'll post a link to the video. Just yesterday my 7yo didn't want to go outside to hula hoop because of the tickle bees. She keeps thinking she'll get stung.